We try to anticipate questions you might have about our office & provide answers here. If you need additional information please contact us. What does a city marshal do? The city marshal is the executive officer of city court. A more detailed answer is: The city marshal is same as the sheriff, only the marshal's jurisdiction is in the city or ward/s. The marshal or deputy marshal/s will execute all orders handed down from the court. This includes bench warrants issued, civil paper service, evictions, seizures, marshal sales and court room security. You can call one of the numbers for bonds and fines on the contact page and give them your name and they can look it up. We are pleased to announce that you can now pay online using the nCourt payment system located on our home page. We can also accept payments over the phone with the nCourt system using a credit / debit card with a visa or mastercard logo. There is also a 5% fee for using the card. Some traffic offences and all criminal offences can not be paid because they have a manditory court appearance by the judge. I have a warrant. How can I take care of it? First you will need to determine what kind of warrant you have by calling bonds and fines or the warrant division on the contact us page. If you have bench warrant for missing a court date you may be able to simply pay a deposit and get a new court date rescheduled. If you have probation warrant, you will need to contact your probation officer and try to clear it up through their office. Some warrants can be cleared up without going to jail, but you will need to contact the appropriate office to make sure. I had a notice to contact from your office on my door. What do I need to do? On the notice to contact tag there should be a deputy's name and number toward the bottom. You will need to contact that deputy so he can tell you what the notice is in reference to and advise you what needs to be done next. Is the City Marshal going to offer the "Amnesty Program" again? At this time there are no plans to run the amnesty program. 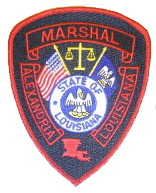 It is the mission of the Alexandria City Marshals Office (Rapides Parish Ward's 1, 2, & 8) to achieve excellence in service to the Municipal Court for the City of Alexandria in its efforts to protect the Court and its customers, to serve warrants of arrest and all orders of the court effectively, efficiently, and with equality to all persons while also enforcing the laws of Louisiana and the United States of America. Content Copyright 2018. Alexandria City Marshal Office. All Rights Reserved.